Bhutan, a tiny country tucked between Tibet and India, is filled with natural beauty, incredible spiritual history, and a deeply rich culture. Embark on an adventure through this mountainous country using the Six Senses Lodges as home base. Six Senses Bhutan has five different properties scattered throughout the western and central valleys of the area. Start in Thimphu, a palace in the sky, overlooking the capital city. Located at 7,710 feet, this property has some of the most stunning views of the surrounding valley and is perfectly located to visit the best attractions in the area. Continue on to Punakha, where Six Senses highlights the Bhutanese traditions of farming. Punakha offers a warmer climate, and is very well known for its rice farms. 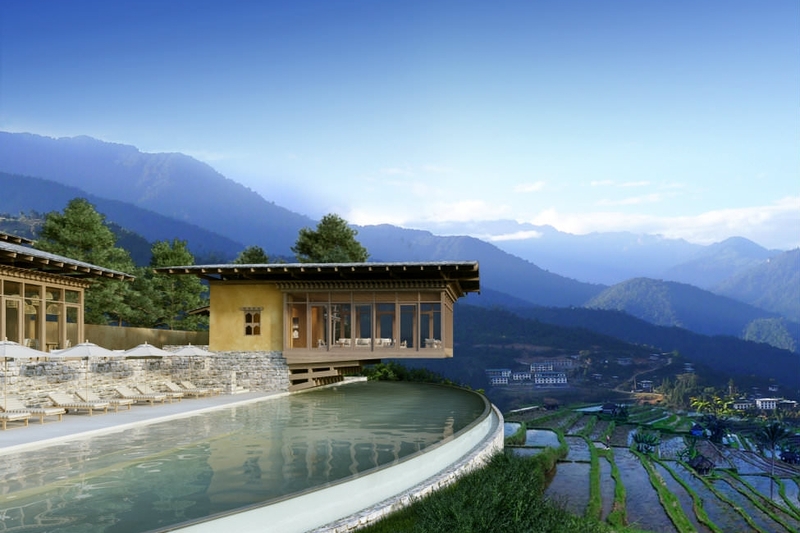 Soak in an infinity pool while gazing out across sweeping views of rice farms during your stay at Six Senses Punakha. Move next to Gangtey, a quiet spot in central Bhutan especially known for its incredible bird-watching. The lodge itself is modelled after a traditional bird-watching bridge. Witness the beauty through enormous windows, and practice meditation in the nearby temple facilities. Gangtey is all about simplicity and nature. Travel into the forest at Six Senses Bumthang. Surrounded by a dense pine grove, this lodge offers horseback riding and access to local villages. Finally, conclude your journey at the Six Senses Paro. Paro Valley is filled with small villages, historic buildings, monuments, and terraced fields of produce. Six Senses operates a 17-acre sustainable farm close to their lodge, which helps to fuel their resorts. During your stay at Paro, hike to the top of Tiger’s Nest for a scenically rewarding challenge. Whether you choose to visit one or two, or all five lodges, you will surely fall in love with Bhutan. Six Senses has created a beautiful adventure through the heart of the Bhutanese Kingdom.